This is the beginnings of a local history site. We hope to offer more in the future. 1. Plainville Cemetery, West Bacon St. Dates back to 1851. 3. Shepherdville Cemetery, Taunton St.
For Obituaries the local daily paper is The Sun Chronicle, Attleboro, MA. You can contact the Attleboro Public Library as they have the full complement of the newspaper on microfilm. The Bliss Union Chapel building dates back to 1871. It was designated as a school on a 1876 map. 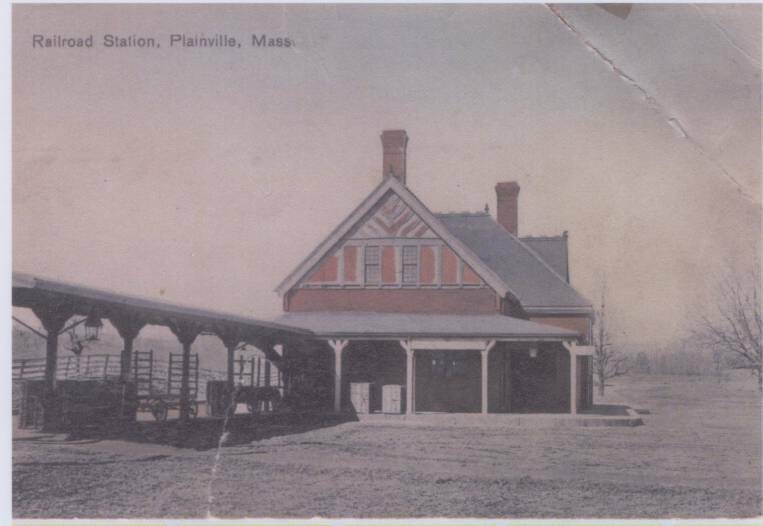 It continued to be a school until 1907 when the Town of Plainville opened up a new school in the center of Plainville. After closing the school, Mr. Bliss gave the building to the community with the stipulation that at least one religious service be held there each year by some visiting clergyman. The last train on the Old Wrentham Branch left the High Street station Saturday night "unhonored and unsung." Not a single soul was in the yard as the engineer gave the final toot on the whistle and waved a good-bye to an imaginary crows just for old time's sake. North Attleboro accepted the passing of its railroad service with indifference and obvious lack of sympathy. The branch line had been little patronized in recent years, the busses having superseded the train as the popular mode of transportation. Consequently there seemed to be no bonds of affections between the present generation and the old iron horse. Representative Frank Kelley was concerned over the elimination of the service, as he believes that eventually it will hurt industry and affect disadvantageously all the people in the district. He continued his efforts to save the branch line Saturday morning supporting legislative order to have the entire matter investigated. Plainville is a characteristically rural community though it has been part of a steadily expanding suburban growth between Boston and Providence for many years. Plainville is situated 14 miles from Providence and 30 miles from Boston, and forms the southwest border of Norfolk County. Plainville is bordered by Foxboro to the east, North Attleboro to the south, Cumberland, Rhode Island to the west and Wrentham to the north. Plainville is 11.1 square miles or woodlands and commercial area with .5 square miles of water with three major river basins, two lakes and many ponds and streams, which contribute to scattered wetland areas. Well over half of the population over the age of 25 has a college degree or at least some college. Over 94% of those who commute to work drive alone with an average commute time of 24 minutes. The unemployment rate is 8%. Nearly 4% of the population lives below the poverty line. The town of Plainville is served by two elementary schools: the Anna Ware Jackson for grades K – 3 and the Beatrice H. Wood for grades 4-6. The King Philip Regional school system houses grades 7-12 at two schools located in Norfolk and Wrentham. There are a total of 829 local students; 69 in preschool, 121 in kindergarten, 639 in grades 1-6. Then the students move on to the Regional School District, where there are a total of 877 in grades 7 and 8, and 1,254 in High School. All of the schools have had recent upgrades to their facilities in the last 8 years. Students also attend Norfolk Aggie, Tri County Regional Vocational Technical, Foxboro Charter, Benjamin Franklin Charter, Bishop Feehan and St. Mary’s Sacred Heart. The town has a very vibrant and recently built Senior Center with many programs and events for seniors. The other town facilities are getting on in years, specifically town hall and the police and fire station. The town does have a website for town information but the town is perceived as not being on the cutting edge of technology. There is a newer retail area at the junction of routes 495 and 1, along with the horse racetrack. There has been considerable build up in recent years along routes 106 and 152 featuring many small businesses and retail operations. But the town is still haunted by the possibility of toxic materials from the landfill and old Engelhard plant. Sources of water and pump stations continue to be a source of worry as well, as the quantity does not allow for maximum build out at this time. There may be opportunities in the town with the possibility of a Racino at the racetrack, the revitalization of the downtown area with the removal of the old Falk’s Market building, and tournament use of the Field of Dreams. 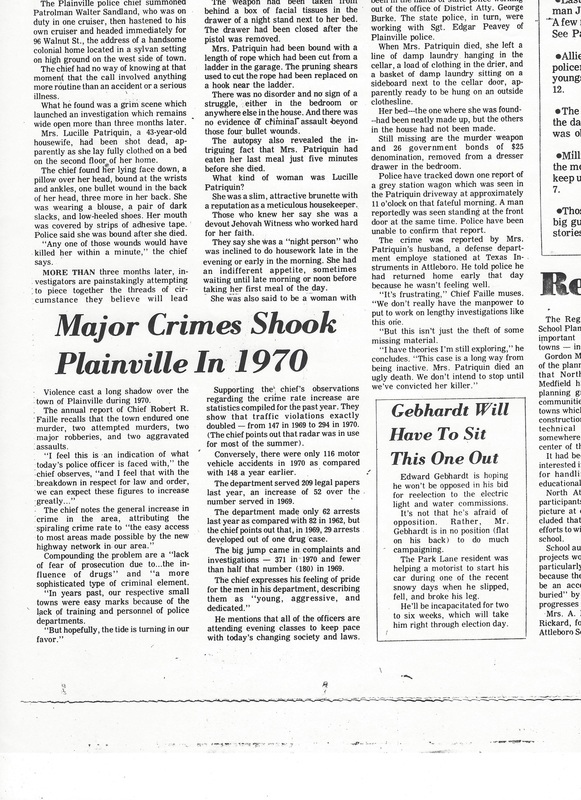 Why was "Plainville" selected as the name of our town? - For years Wrentham referred to our community as "the plains". 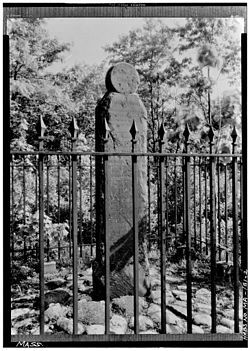 Why was our community called "Slackville" in the early and mid 1800's? - Mr. Slack was the largest land owner as well as the owner of many buildings. 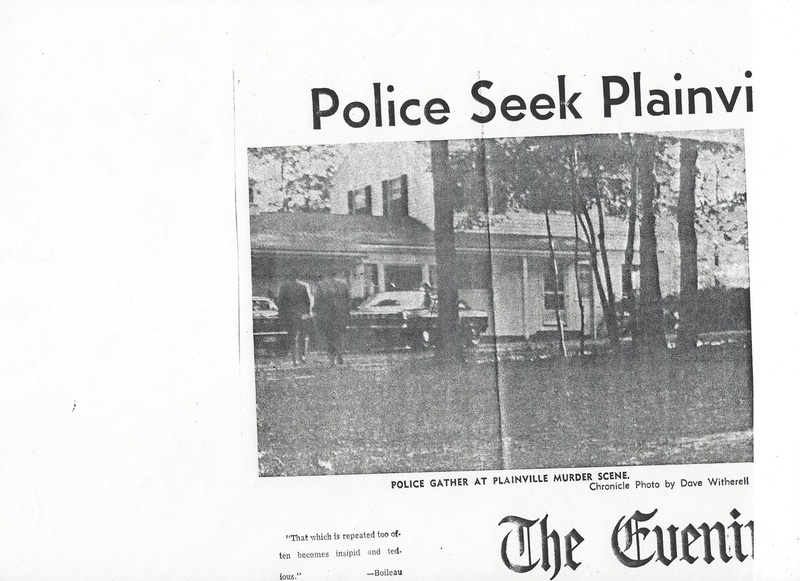 How did "Shepherdville" attain its name? - There were two, perhaps three, families named Shepherd. The map of 1858 shows a Shepherd St and Turnpike Lake was then called Shepherd Pond. A weaving mill and a carpet factory as well as a store were recorded on the 1876 map. The weaving mill and carpet factory were replaced by a woolen mill which we know was owned by the Shepherds. It is very possible that the other mills were also started by the Shepherds. How did the "Ten Mile River" get it's name? - No real answer has ever been given that we know of. But perhaps it is because when ships came into port people referred to coming 5 miles or 3 miles or 10 miles to a river. So perhaps merchants began referring to the rivers as such. Who was Anna Ware Jackson? - She was a teacher for 53 years of which 44 were spent in Plainville. 1911 - June 29 - Large factory fire owned by Maintien Brothers and Elliott (at present site of Plainville Stock, Co.) Lack of water blamed for the destruction of the building. Summer - several forest fires reported. 1918 - Winter - Fire hydrants froze up. A ten year contract was signed with North Attleboro to pump water. 1921 - Town Hall partially destroyed by fire. 1924 - March 3 - Voted to appropriate money to to connect water main of Plainville to North Attleboro on West Bacon St.
October 3 - Last electric street car from Wrentham to Plainville. 1925 - Voted to buy Metcalf property which became the Town Park. An addition to high school was added. 1927 - Task of digging up street car rails was begun. 1941 - New combined fire and police station and town offices was begun. Plainville Lions Club was formed. 1953 - St. Martha's Church opened. 1955 - March 7 - The old fire station was given to the Boy Scouts. 1956 - March 28 - Construction on King Philip High School began. 1958 - March 3 - Sold the Town gravel pit to Hilsinger Corp.
Carpentry and machine shops in operation at King Philip High. 1963 - November 18 - King Philip School District formed. PAL leased land on George St. for 99 years for $1. 1964 - New elementary school on Messenger St. was approved. 1989 - November 19 - New Library opened at 198 South St.
2000 - August - New Council on Aging building was opened. Built with many volunteer hours and revised plans from the Cumberland Farms in town. 2014- The Plainridge Racecourse become Planridge Park, the state's first Casino, with slots, restaurants and live racing. 2015 - The new building opens on former site of Falk's Market, containing a book store, "An Unlikely Story", programming space and third floor office space. 2017 - The Oasis apartments are built on Route 1. 2017 - Vote at town meeting to authorize funding for new Town Hall and Public Safety building located at 200 South St. 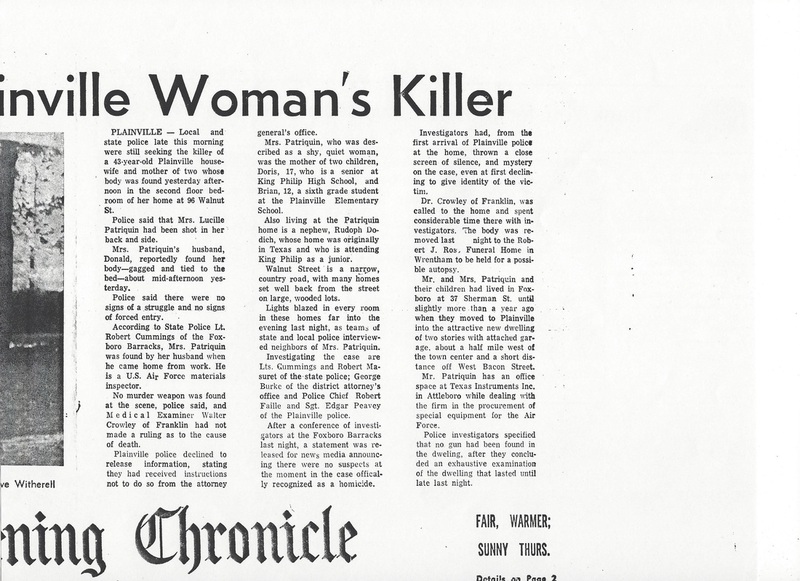 Articles from "The Evening Chronicle" regarding a murder in Plainville.